The main driving force behind the development of new applications for chitin and its derivative chitosan lies with the fact that these polysaccharides represent a renewable source of natural biodegradable polymers. Since chitin is the second most abundant natural polymer, academic as well as industrial scientists are faced with a great challenge to find new and practical applications for this material. This book provides an examination of the state of the art, and discusses new applications as well as potential products. Applications of Chitin and Chitosan deals almost exclusively with applications. Previous books in the field have devoted less than 30% of their material to commercial or medical uses. In the past thirty years, substantial progress has been made on fundamental and applied research in chitosan technology. One of the driving forces behind this rapid development has been the decrease in the supply of natural resources. At the same time there has been an increased realization that there are abundant alternative bioresources. Two factors-economics and versatility-have also stimulated interest in chitosan's utilization in various fields. Chitin and chitosan derivatives have applications in fields that range from fertilizers to pharmaceuticals. Chitosan is no longer just a waste by-product from the seafood processing industry. This material is now being utilized by industry to solve problems and to improve existing products, as well as to create new ones. 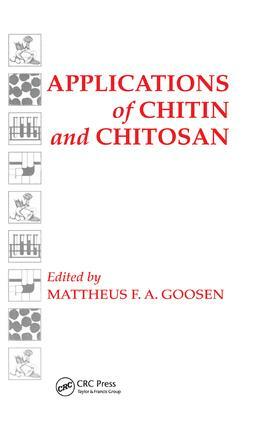 Applications of Chitin and Chitosan is illustrated with over 100 photos, charts, graphs and figures and more than 40 tables. Applications of Chitin and Chitosan will be of interest to industrial personnel involved in bioprocessing as well as bioengineering students, specialists in the biomedical and biopharmaceutical industry, biochemists, food engineers, environmentalists, and microbiologists and biologists who specialize in chitosan technology. Publication: Fall 1996.